Friday 13th December 2014 saw a host of Wisbech talent take to the stage in support of the charity 'My Friend Paul'. Orgainsed by teacher Jacob Keet, who is also a member of our church, the event was a fantastic celebration and featured musicians from different parts of the community including Thomas Clarkson Academy Strings, Wisbech Community Children's Choir, Wisbech Grammar School Flute Trio, the Clarkson Singers, Wisbech Community Choir and an amazingly talented young harpist Rosie Scott. 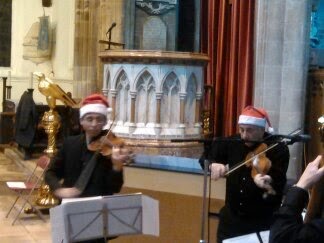 Our church was also represented by Jacob, Alan and Clive who played violin and accordian to some very rousing Eastern Eurpoean pieces.